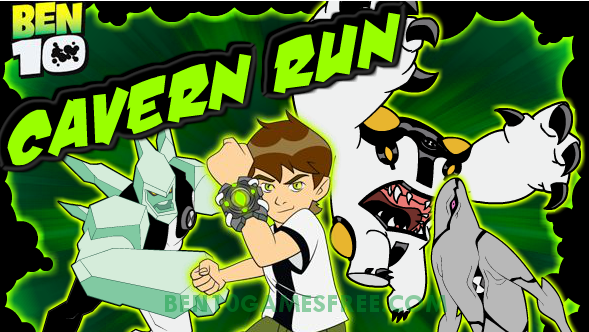 Thank me later for bringing this amazing ben 10 game for you – Ben 10 Cavern Run! Run across the laser bridges and walls to make Ben reach from the beginning door to the end door. And guess what you get to make the laser bridges however you want them. So, think before you make them! Let me give you some more insights on Ben 10 Cavern Run game. Ben 10 Cavern Run is an adventure running game where Ben goes across different stages from doors to does running and jumping. You may ask what is your task in this game. So, let me tell you. All you need to do in this game is to build laser bridges between the entry and the exit doors. And guess what? You have three aliens to use in this ben 10 running game i.e. Diamond Head, Cannonbolt and Ghostfreak. Recommended Game: Play Ben 10 Protector of Earth Game Online Now! Well, the game begins as Ben enters into a cave chamber with an exit door. But, to reach the door and exit, Ben 10 has to go from platform to platform. Although Ben runs and jumps on itself, you have to make his way easier by connecting platforms or stones with laser bridges. Remember, only making Ben reach the exit is not the task, you have to collect the most number of green orbs to get extra bonus points. Apart from collecting orbs, each level has an Omnitrix too. When you get the Omnitrix, Ben will transform into alien and you will get special powers that you can use to complete the stage. Like when Ben 10 becomes Diamondhead, you will not be affected by the dropping stones. Check out the table below to know the superpowers of each alien in the Ben 10 Cavern Run. If you fail to make Ben reach the exit door and he jumps down or gets hit by rocks or electric flash, You game will over! It is one of a kind adventure run game where you don’t control the player moves directly but indirectly by making walls and bridges! Interesting isn’t it? Note: Ben 10 Cavern Run is also available for Android and you can check out Ben 10 Cavern Run apk too. Make Laser Platforms and Help Ben reach the Final Exit door of the Cavern to Win! Good Luck!! Don’t Forget to give your rating for Ben 10 Cavern Run and share your tips and tricks to win this game in the comments section below.